Clearing the land before the green. 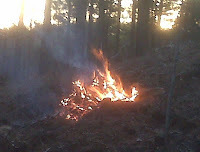 We have been busy today clearing and burning trees, bushes, and vines from the four acres at Spokane. Getting rid of thorny vines before they start to spread in the Spring allows guests to enjoy the entire property. If the weather permits, we will be out there again in the next few days clearing some more. Spring break is just a few weeeks away and who knows what the weather will do. With cabins surrounded by evergreens, sunny or snowy doesn't really matter. If it is warm, take a stoll down a hiking trail or just enjoy the warmth of the clean Kiamichi air. If the day turns out cold, build a roaring fire or stay warm in the hotub. That's one reason cabin vacations in Beavers Bend are as close to perfect as a getaway can get.